As a more experienced golfer, you may appreciate the challenge that The Royal’s eighteen-hole, championship-style course offers. This is an old-fashioned shot-makers’ course that demands more of a golfer with each round played. The Royal Nine offers a par-35 course, the perfect environment to improve your game and relax with friends. The Royal Ottawa Golf Club offers one the finest courses in the area. Graced by the natural beauty of the Gatineau Hills, our 18-hole facility spans 6600 yards, par 71. As a member, you will enjoy the Club’s in-town location, availability of tee times, and speed of play; every golfers dream. The original Course architect was Tom Bendelow of Chicago, who at the time was a leader in the industry. The original design was subsequently amended by Willie Park Jr., winner of the British Open in 1887 and 1897. The Royal Ottawa course is a natural, old fashioned layout, designed according to what has been called ‘the Scottish principle’, where emphasis is placed on the natural lay of the land, rather than artificially created hazards. These features are emphasized on holes number 9 and 15 which require precisely placed tee shots to be followed by Woods or Long Iron approach shots for all but the longest of hitters. The topography is unique as it was built before the days of massive earth-moving equipment. It’s hills and dales have always been a source of both joy and frustration. The various tee positions fairly challenge all caliber of golfer. At the end of a round one will have used every club in the bag. The greens are fast and smaller by design requiring accuracy, clubface control and skill. As examples, the first three holes of the back nine challenge the golfer to hit precise shots to the green. Number 10 is as small and well protected a green as can be found, while landing the ball in the wrong area of 11 or 12 often results in a three putt due to the slope and speed of the surfaces. The Royal Ottawa course caters to those who like to walk. Tees are located close to the previously played green so that there is little delay. Indeed the majority of rounds are completed in well under 4 hours, without feeling as if one “raced” around the course. As well, the club boasts a spectacular variety of trees on the property that offer the player an excellent backdrop of changing colors throughout the year. After a satisfying round of golf, there is no better place in Ottawa/Gatineau to enjoy a post game refreshment than The Royal’s exquisite patio or verandah. The golf course views are spectacular. The Royal Ottawa members are committed to continuing the tradition of maintaining a superbly conditioned golf course and unquestionably one of the premier golf courses in North America. A state of the art watering system was installed in 2001 while all of the bunkers were completely renovated in 2004. The LPGA was played at The Royal Ottawa Golf Club in 2000 with the cumulative combined scores of all players being above par attesting to the challenging nature of our course. The feedback from these professional golfers, was extremely positive. For these reasons, as members, we never tire of playing The Royal Ottawa course. Our course has the feel of being in Scotland or Ireland. We enjoy playing other fine courses but always look forward to returning home. The Royal 9 is the ‘jewel’ of The Royal Ottawa Golf Club. At just over 2500 yards, the 9-hole course is the perfect venue for new golfers of any age. It is a great way to introduce children to the game, and offers a perfect outing for the family that includes golfers of varying ability. In fact, the Royal 9 can be a true test for even the most seasoned golfer. Many of our experienced golfers also use the Royal 9 to hone their skills. The Royal 9 has undergone a significant transformation in recent years, to make the course more challenging, including the addition of a tricky little par 3 at hole number 4. The rating for men is 63.9 with a slope of 103, while for women it is rated at 69.2 with a slope of 121, and par is set at 34 and 37 respectively. Many of our members make an afternoon of it, and enjoy the challenge of the Royal 9 followed by dinner in the clubhouse or at one of The Royal Ottawa’s sumptuous barbeque buffet dinners. Our popular “Nine and Dine” special package offers our members the opportunity to bring guests for a round on the Royal 9 with dinner in a relaxed yet challenging and fun environment. 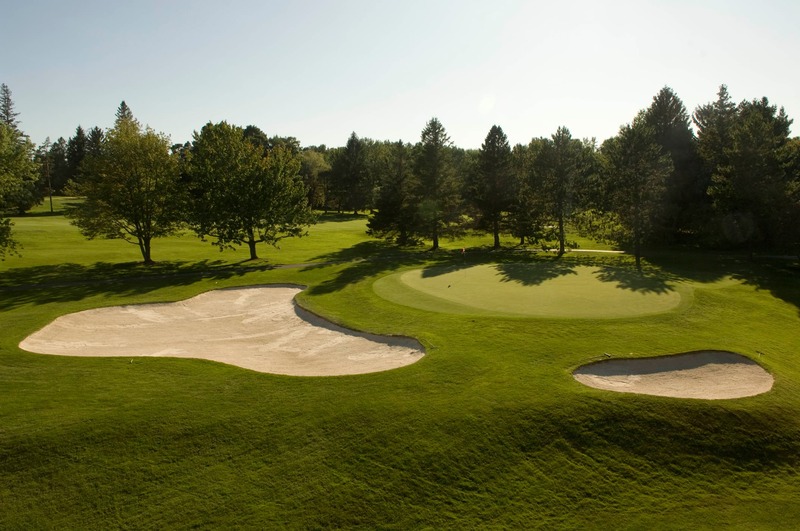 The Royal Ottawa Golf Club is well recognized for the consistency and condition of its golf courses. The main course and the Royal Nine are maintained in immaculate condition from the opening of the season until the snow flies. What is often overlooked, but much enjoyed and appreciated by our members and guest alike, is the extensive practice facilities we offer. These are available to all of those interested in improving their game, or simply ‘killing some time’ enjoying a sport we all love. Provides a rain shelter and fully serviced washrooms. Provides for a separate chipping area where you can choose to chip from fairway, fringe, or first cut of rough lies. Strategically located near the Professional Shop where you can not only practice your lag putting and those testy 3-footers, but also see the comings and goings of our members and guests – great for lining up your matches. Most bets are won & lost before you get near the first tee! Located near the Putting Green and available for those simply looking for a quick few warm-up swings before the round or that ‘magic’ something picked up in the magazine or on the Putting Green. While these facilities are well used and in excellent condition, we continuously strive to improve our facilities in order to heighten the enjoyment of our members and guests. The Practice Range underwent an extensive renovation in 2008 which expanded the natural grass teeing area by over 40%, irrigation and drainage facilities were installed in the practice field itself, and target areas were re-shaped and made more visible. Membership at The Royal Ottawa carries the distinct benefit of playing privileges with stunning golf clubs in North America and abroad. While away from home, you can enjoy access to some of the world’s most prestigious clubs. The Royal Colwood Golf Course offers members and guests 4 sets of tees to provide a good test of golf. Each set of tees can provide a challenging test to the golfer based on their ability. The Royal Montreal Golf Club was founded November 4, 1873 making it the oldest golf club in North America. The Blue Course continues to be ranked as one of the “100 Greatest Courses in the World”, and was voted 12th best course in Canada by Scoregolf readers in 2006. Located a stone’s throw from the Montmorency Falls and only minutes away from the Old Capital, the Royal Quebec is one of the oldest golf clubs in America. Established in 1899, The Royal Regina Golf Club is Saskatchewan’s first and oldest golf club. Our prestigious, semi-private golf club holds the distinction of being one of only five courses in Canada with official “Royal” designation. Ashburn Golf Club has been an integral part of the Halifax landscape since 1923. Now with two challenging 18-hole golf courses and a comprehensive practice facility, Ashburn takes its place among the leading private golf clubs in Canada. Club Laval-sur-le-Lac is proud of its motto «À Nul Aultre Ne Cède», adopted following a fire that completely destroyed the clubhouse on September 10, 1951. This motto represents our determination to strive continually towards excellence, at all levels, as we provide our members and their guests with a memorable experience, every visit. Our founders dreamed of creating an enviable, prestigious club, ranked among the best in Canada. Essex Golf and Country Club, in Windsor, ON was designed by Donald Ross, and it remains very true to its original design. In fact, Essex is one of the very few Donald Ross designs in Canada and has proudly hosted the Canadian Open, the LPGA duMaurier Classic and the Canadian Senior professional championship. .
Four unique golf course layouts and 45 holes of golf await members at The Glencoe Golf & Country Club designed and built under the exacting hand of master architect, Robert Trent Jones, Jr.
Islington is a challenging 18-hole, par 72 golf course (74 for ladies) with tree-lined fairways and 6500 yards of mature grass. The 18-hole “Club De Golf Kahnawake” course at the Club De Golf Kahnawake facility in Kahnawake, Quebec features all the hallmarks of Quebec golf. Club De Golf Kahnawake golf course opened in 1912. Established in 1924, Ladies’ is the only golf club in North America owned and operated by women. Men have been an important part of Ladies’ since 1936 and can become Guest Card Holders. London Hunt was established in 1885.The Club provides an 18-Hole, 7200 yard’s championship golf course designed (1960) by renowned Golf Course Architect, Robert Trent Jones and renovated (2000) by his son, Rees Jones, one of today’s leading Golf Course Designers. This private 18 hole championship course is considered a Golfer’s Golf Course. Members and visitors alike agree that Lookout Point provides a real golf challenge with every round played. Today, Lookout Point is consistently ranked among the Top 100 Courses in Canada by Score Magazine. For over 85 years, the Members of Marine Drive have set standards of excellence. An ideally situated and mature course, Marine Drive has been the home of many champions including Stan Leonard, the Club’s long-time honorary professional. At just over 6,300 yards from the blue tees, it is certainly known for its difficulty as opposed to its length, but at par 71, many players will tell you it plays longer than expected. Priddis Greens is located near Priddis in the rolling foothills of Alberta. Over the past 20 years Priddis Greens has been constantly improving its facilities to meet the expectations of the Members. In July 2003, Priddis Greens was awarded GOLD status in the “Best Private Course in Canada” category by Score Golf Magazine’s Golfers’ Choice Awards. Scarboro dates back to 1912 and has been the site of four Canadian Opens. The golf course was redesigned by golf architect A. W. Tillinghast in 1924. The course is a par 71, with its signature hole being the par 3 at #4. Some of the game’s greatest players, golf immortals and distinguished world figures have trod the lush fairways of St. Charles and enjoyed its special ambience. Victoria Golf Club is the oldest golf club in Canada still on its original site – a rocky point on the southern end of Vancouver Island overlooking the Strait of Juan de Fuca in the Municipality of Oak Bay. From it’s humble beginnings as a four hole golf course begun by four friends in 1909, on the east bank of the Humber River in the small town of Weston, the Weston Golf & Country Club has grown into one of the premiere golf courses in Canada. Set on over 400 acres of green with a meandering brook and ponds, members enjoy 27 holes of unspoiled beauty. The Golf course is easily walkable, deceptively challenging, and impeccably groomed. All of this is almost incidental the access members enjoy. NO TEE OFF TIMES. Yes, members simply announce their presence to the starter and tee off. Stonewall was conceived 14 years ago by golf enthusiasts who longed for golf in its purest form – without tee times or restrictions; where players are encouraged to walk the course. The construction of Royal Ascot’s brand new 18 hole Championship Parkland Course opened for play in August 2005. Royal Ashdown Forest Golf Club, founded in 1888, is ranked by Golf World as one of the top 100 clubs in the British Isles. The most memorable characteristic of the current Blackheath course is the strength of its start and finish. Nestling under the South Downs The Royal Eastbourne Golf Club offers all golfers from the beginner to the low handicapper, a great golfing experience. Set within 130 acres of chalk downland with panoramic views in every direction, the beautifully maintained greens and fairways of the Devonshire course (18 holes) and the Hartington course (9 holes) provide the perfect environment for golf. Built on chalk with excellent drainage the courses are rarely closed enabling quality golf to be played throughout the year. Founded over 100 years ago, Royal Mid-Surrey Golf Club is an island of tranquility in an increasingly demanding, stressful, modern world. Founded in 1864, Royal North Devon is the oldest golf course in the country and is regarded as the St Andrews of England. The superb undulating Course set in mature parkland provides a challenging game of golf to professionals and amateurs alike. The layout has remained largely unchanged since James Braid’s alterations in 1924. Squeezed beautifully between Brancaster Bay and the salt marshes, Royal West Norfolk truly is a peaceful golf links, except when the wind blows. The course measures 6348 yards with a Standard Scratch of 70. Every hole requires a well placed, sometimes long drive, to give the opportunity of a par or better. Royal St David’s Golf Club is Nationally and Internationally renowned and is the home of one of the finest traditional championship links courses in the world. A traditional old Scottish links, the Royal Aberdeen is well bunkered with well undulating fairways. It is an excellent balance of holes, strong par 4’s, tricky par 3’s and two classic par 5’s. The Medal course at Montrose is a majestic layout in the true traditions of Scottish Links golf and has hosted many events in its history. Royal Musselburgh Golf Club is at the start of the famous stretch of golf courses on the East Lothian coast, situated to the east of Musselburgh, this picturesque parkland visit is certainly worth the visit. Royal Perth is situated in a Georgian crescent in the beautiful city of Perth, Scotland. The Club overlooks the historic North Inch and River Tay and offers very comfortable dining and recreational facilities. The Blairgowrie Golf Club was founded as a private members club in 1889 and is situated in the heart of the magnificent Perthshire countryside. The Club features the renowned Rosemount and Lansdowne championship courses plus a very attractive 9-hole course which are set in heather lined avenues of pine and silver birch. Founded on November 9th 1881, The Royal Belfast Golf Club is the oldest club in Ireland and its formation proved to be the inspiration for the growth of the game in Ireland. Situated in Newcastle, Royal County Down is not only a fine test of golf but has accompanying scenery that is spellbinding. Located on an island in Dublin Bay, the Royal Dublin is a private members club with a warm welcome for visitors from home and abroad. The traditional links course at Seaton has been the venue for many international and interstate matches and championships for over 100 years. The Club has hosted nine Australian Open Championships and sixteen Australian Amateur Championships. The Acton course was built on the banks of the Molonglo River and, with the river as a constant threat to wayward shots, soon earned a reputation as a superb and challenging test of golf. Royal Fremantle is a players course, challenging and enjoyable. Members join Royal Fremantle because the club has one of the finest golf courses in Western Australia turned out week after week for members to be challenged and enjoy. Royal Hobart Golf Club is recognised as Tasmania’s premier members’ Club and championship course maintained in impeccable condition all year round. The Royal Melbourne Golf Club is recognised as one of the preeminent golf courses in the world and a leading golf club in Australia. The fine traditions established at Royal Perth over the past 100 years have provided much enjoyment for countless golfers. A distinctive feature of Royal Queensland is the striking profile of the Gateway Bridge which soars high over the course and the adjacent Brisbane River. At first sight the land on which Royal Sydney Golf Course is situated appears flat, but in reality this is by no means the case, as it is full of minor undulations and excellent golfing features similar to those of the best sea side courses. Royal Wellington Golf Club, founded in 1895, has one of New Zealand’s most beautiful and historic golf courses.Sited at Heretaunga, just north of Wellington, the course is one of the best tests of golf in New Zealand. Royal Auckland Golf Club offers one of the greatest tests of skill in the region with difficult par 4 holes and the strategic placement of bunkers around greens. The Club is well on its way to fulfilling its vision of having a course of international standard (both in terms of the quality of its layout and its standard of presentation). Lake Karrinyup is renowned for its challenging layout. The lush undulating couch fairways and manicured Bent grass greens are set around a large natural lake and amongst a forest of magnificent native trees and plants. With lovely views of Table Mountain from most holes this championship course offers a beautiful setting that will make your visit here truly memorable. Royal Durban is a links type golf course and is one of the very few golf courses to be sited in the middle of a horseracing track. Royal Harare is comfortably spread out on a large tract of land in the city’s green and spacious northern suburbs.The kikuyu-grass fairways and Macginnes-grass greens are invariably in immaculate condition, and even the rough is well groomed. The East Course is a championship layout that has hosted 7 South African Open Championships, the SA Amateur and numerous other Tour events. Its three full 18 hole courses at Fanling and a 9 hole Par 3 course at Deep Water Bay, have made The Hong Kong Golf Club one of the premier golfing complexes to be found anywhere. Stretching across Shenzhen and Dongguan, Mission Hills is the World’s No.1 golf club. The Club boasts 12 world-class golf courses with 216 holes. Golf in Sri Lanka, like many other British sports gained popularity on the Galle Face Green. The Colombo Golf Club was formed here and in 1896 moved to its present location which was a model farm originally owned by Sir Charles Henry de Soysa, a Ceylonese philanthropist. In 1928 the privilege of using the prefix “Royal” was bestowed upon the Club by His Majesty King George V.
This Tudor-style club is located in the heart of downtown Montreal where you can take care of your health, business and family. The Union Club Of British Columbia has 22 guest rooms, including 7 suites with separate sitting rooms available to members, their guests and Affiliate Club Members. Many rooms have magnificent views of Victoria’s beautiful Inner Harbour. Overnight accommodations are located on the top floor of the clubhouse, where members and guests can book King, Queen, and Twin rooms, as well as Suites. These overnight facilities are open throughout the year. * indicates that green fees are required. The Junior Golf Program provides activities that serve the needs of three categories of Junior Golfer: newcomers, developing Juniors and competitive Juniors. Club sponsored activities that begin in early May continue through to the School exam schedule in mid June…then resume during the first week of July. Our practice facility and Royal Nine golf course provide excellent opportunities for Juniors who wish to learn, develop skills and enjoy the game with friends and family…practically any time of the week, all year. Juniors can join as early as age six years (with some playing restrictions until age nine years)…all designed to encourage family play. The Professional Golf staff are key supporters of skill development through coaching, clinic and camp instruction and have developed a very well structured golf school specifically tailored to our Juniors. The program includes 2 four day camps during the first week of July and August that is geared to newer golfers. In addition, there is a 6 week coaching program, twice per week from May to mid June for developing players. We also have a series of 4 Saturday clinics during May and June for our newer golfers. All in all, the Club is a true supporter of Junior Golf. Professional Shop – opens a half an hour prior to the first tee time. Practice Range – opens a half an hour prior to the first tee time and closes one hour prior to dusk. Originally from Montreal and a graduate of McMaster University, Paul is a 30 year veteran in the golf industry having learned the game from some of Canada’s finest golf Professionals in Quebec and Ontario. Paul has been recognized as a true ambassador of the game by being appointed to both National and Regional level board positions, along with serving as Ontario PGA and Ottawa Valley PGA President. Paul was named 1992 Ontario Assistant Professional of the Year, 2004, 2007 and 2008, Ping Fitter of the Year and most recently 2005 Head Professional of the Year. He is a certified Level II hockey coach, and a Ping, Callaway, and Titliest Club fitter. Paul is happily married and a proud father of a budding junior member here at Royal Ottawa Golf Club. 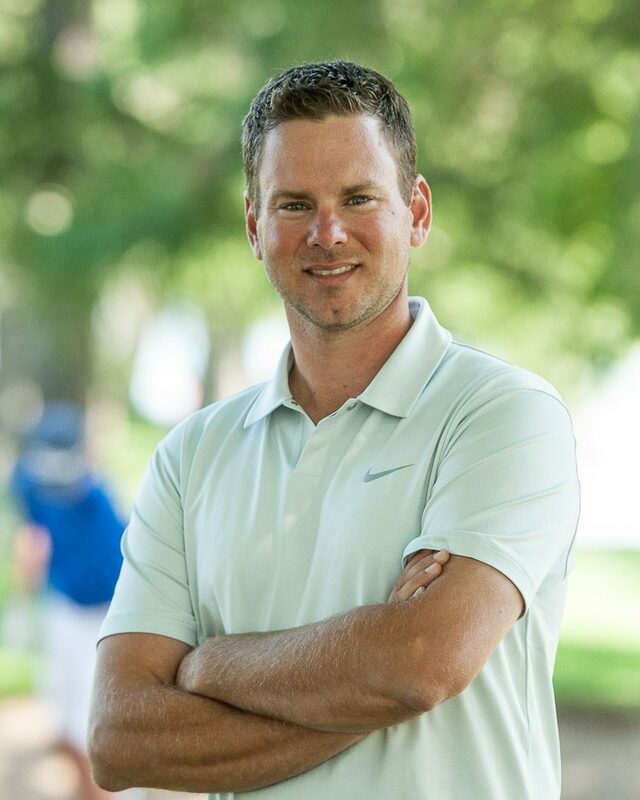 Originally from small town Port Rowan and a graduate of Niagara College in the Golf Club Management program, Marc grew up an athlete playing highly competitive sports but found a passion for golf and the industry at a young age. He is a former employee of the Royal Ottawa Golf Club completing his two term co-op with us. From there, he spent four years in London, ON gaining a knowledge and understanding of the industry, dedicating himself to the members, and advancement of the game. Marc looks forward to sharing and helping you enjoy your experience at the Royal each day. Originally from Newcastle, Ontario, J.C. spent four seasons as an Assistant Professional at The Oshawa Golf & Curling Club, where he played a large part in of the development of the Junior golf program. He also grew up playing as a junior there since the age of 12. In 2009, he graduated from Ohio Valley University with a degree in Marketing & Management and was a four year starter on the Men’s golf team. As a professional, J.C. is a Class ‘A’ member, a certified club fitter, and a PGA of Canada trained Coach of New Competitors. Since the age of 15, J.C. has been no stranger to competition. As an amateur, he played in the Canadian Amateur championship twice, and continues to compete in local, provincial, and national championships as a professional. J.C. is also a certified Level 3 hockey referee and most recently, an Ontario Curling Association trained Club Coach. J.C. is excited to begin a new journey at The Royal Ottawa Golf Club and looks forward using his knowledge, experience, and love for the game to assist you. Growing up in Smiths Falls, Dave played many sports but found a passion for golf at the age of 13 when he started working in the back shop at the Smiths Falls Golf & Country Club. A graduate of the Professional Golf Management Program at Humber College where he played on the National Championship Golf Team in 2005. Dave is a Class ‘A’ member of the PGA of Canada and is currently ranked 23 on the PGA of Canada Player rankings. A few playing highlights include Spring Open Champion (2011), and winner of the PGA of Ottawa Zone Championship in 2015 and 2016. Dave was named Assistant Professional of the Year for the Ottawa PGA in 2015 and nominated in 2016 & 2017. When not at the golf course Dave enjoys spending time with his wife and two boys. The Professional Shop prides itself on carrying a wide variety of the industries finest men’s, ladies and junior apparel to best suit our members golfing and fashion needs. Callaway, Ping, King Cobra, Taylor Made and Titleist fitting systems are all present on site and are available to properly fit your personal equipment needs. Video teaching is another serveice offered to provide the very latest in teaching. The Professional staff is always on hand to assist you with any golf or corporate equipment related issues, questions and any of your Royal Ottawa Golf Club related inquiries. The CPGA Professional staff has flexible schedules that easily accommodate to booking private & group lessons. Available to fit your golfing improvement needs, the Professional staff offers a variety of instructional opportunities. These include: video analysis, on-course playing lessons, coaching programs, private lessons, group lessons, and clinic settings. It is the initiative of the Golf Professionals to work with the student to best establish a program that will see growth, improvement, and enjoyment in their golf game. Our corporate program continues to grow in popularity. Prizes, gifts and tournament giveaways of any quantity, price and embroidery options are available to meet your business needs. Our corporate program offers timely service at the best price in town without any added cost that a marketing company would apply. Contact Paul Carrothers at (819) 777-0593 ext. 3 or paulc@rogc.com for further details or catalogue request. Click here for a PDF containing directions and other useful information about visiting The Royal Ottawa Golf Club. The Club is conveniently located only minutes from centretown Ottawa/Gatineau. At just 10 km from the Parliament Buildings, The Royal offers exceptional accessibility for a quick nine before work or a leisurely eighteen on a warm summer evening. As a Private Golf Club, the member who introduces you should provide you with all necessary information to make your visit to our Club a memorable one. Here are a few guidelines that will enable you to have a relaxing day at The Royal. Upon arrival, please present yourself to the Professional Shop personnel who will be pleased to assist you with further directions and any other assistance you require. The Royal maintains a dress code policy that is in keeping with the traditions of the game of golf. Feel free to contact the Professional Shop at 819-777-0593 and they will be happy to answer any questions you may have. We pride ourselves on our ability to maintain a normal pace of play of 2 hours per nine holes and a total of 4 hours for 18 holes. We hope you enjoy your day at The Royal. After the game, we hope that you have an opportunity to enjoy our clubhouse facilities including our excellent menus and services. The Royal maintains a dress code policy that is in keeping with the traditions of the game of golf. Men – golf shirts with a collar or turtle neck tucked in, tailored golf shorts no higher than three inches above the knee cap and sockettes or knee length turn down socks are accepted. Blue jeans or golf sandals are not allowed as part of our club dress code. Ladies – golf shirts with collars, turtlenecks or mock turtlenecks (sleeve or sleeveless) are acceptable. Golf shirts without collars must have sleeves. Full-length golf trousers or Capri style golf pants, golf skirts, golf dresses and Bermuda style or tailored golf shorts of an appropriate length are acceptable. They may be no higher than five inches above the kneecap and not above mid-thigh. Knee length socks, sockettes or quarter socks are acceptable. Blue jeans are not permitted. All attire listed above as appropriate for the golf course is permitted. In addition, the following guidelines are applicable: socks are optional; sandals may be worn by ladies only; and golf hats, caps and visors must be removed when inside the clubhouse except when in transit to and from the locker rooms. Other fashions appropriate to the occasion are also acceptable. The following are not allowed at any time, anywhere on the property: Blue jeans or jean jackets, jogging pants, short shorts, spandex, Tshirts or tank tops.